Four years ago in the Caribbean, it was said that the ICC got the World Cup it deserved. The 2007 tournament was a bloated, corporate, soulless sell-out of an event, infused with a noxious blend of controversy and apathy that turned the self-proclaimed Carnival of Cricket into a six-week wake. In Asia in 2011, however, the ICC got the World Cup that it needed, and that is not the same thing whatsoever. By the standards set in 2007, not to mention those in South Africa in 2003 and England in 1999, the 2011 tournament was a resounding triumph. In fact, an impromptu survey of approximately 1.2 billion people might well conclude that it was the best World Cup of all time. Admittedly some non-Indian observers might suggest those findings had been skewed a touch, but try telling that to the jubilant masses who spilled out of the Wankhede Stadium and onto Mumbai's Marine Drive on Saturday evening, or to anyone who shared the scenes of delirium in every street of every city, town and village of the world's second-most populous nation. The funny thing is, those 1.2 billion people are almost certainly right, but not necessarily for the reasons they might assume. Of the 10 World Cups to have taken place since 1975, none has come close to matching the narrative and drama of the tournament just completed - not even 1992, which is commonly cited as the pundits' pick to date. The greatest triumph of this edition lay not in the final outcome but in the journey that was required to reach that crowning moment, for the excellence of the entertainment was not simply an illusion glimpsed in the moment of India's victory. This would have been a World Cup to savour, irrespective of whether Gautam Gambhir and MS Dhoni had managed to turn the tide of the final in their country's favour. All of which makes Monday's mood-darkening decision in Mumbai so incredibly hard to countenance. 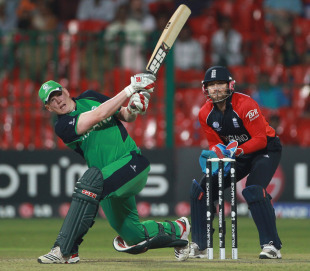 The decision to slam the door shut on cricket's Associate nations - in particular Ireland, whose role in the narrative was so fundamental - and revert to a ten-team formula in 2015, makes a mockery of the spectacle we have just been privileged to witness. Ratnakar Shetty, the tournament director, admitted as much on the eve of the opening ceremony, when he let slip that the group-stage elimination of both India and Pakistan had torpedoed the entire event in 2007. Every available precaution was taken to ensure against a repeat of such a financial disaster, but when England tested the rejigged format to its absolute limits by threatening a group-stage exit at the hands of Ireland and Bangladesh, the doubts crept in. At the time England's struggles appeared to vindicate the tweaks that had been made, but at boardroom level it became clear that changing the locks alone wouldn't be enough to guard against future intrusions. It was time to roll out the razor wire. The decision has been shocking both for its timing and its finality. A sop has been offered for 2019, but by then Associate cricket will have been stagnant for a generation. Even George Dockrell will be in his late twenties and in all probability an England regular - why would or should he squander the prime of his career waiting? - while John Mooney, Kevin O'Brien and all the other heroes of Bangalore will have long since retired. And the fact that the ICC reached their decision a mere two days after the tournament's conclusion suggests that there was never a decision to be reached in the first place. It was simply a matter of announcing the fait accompli. The wider concern is the lack of concern. The public's initial reaction has been gratifyingly furious, but if ever there was a good day for the ICC to bury bad news, it is the Monday after India have won the World Cup, just as the IPL hype machine is beginning to grind into action. If enough righteous indignation is to be summoned to force the board into a change of heart, then a sizeable proportion of the 1.2 billion are going to have to speak out as well. But with some justification, they are a bit preoccupied right now. The tone of this article was never intended to be so downbeat. A remarkable event took place in Mumbai on Saturday, and quite rightly, the celebrations throughout India will resonate for weeks and months to come. Dhoni's decisive six in the final could yet become the most replayed shot in cricket's long history, while no one who claims to love the game can take anything other than delight in the decisive role that Sachin Tendulkar played in his sixth and (presumably?) farewell campaign. Moreover, the best team in the tournament emerged with the spoils, and while everyone loves an upset now and again, it's right that class should prevail in the end. But regardless of all that, the World Cup's postscript is one that ought to freeze the blood of all sports fans, irrespective of how much they've loved or loathed the campaign that preceded it. The most common complaint - particularly from those frequent flyers who took part in the six-week game of subcontinental hopscotch - was that the event was at least a fortnight too long, although that issue is one that is stipulated by the ICC's long-standing broadcasting deal with ESPN Star Sports, and hence a ten-team all-play-all format in 2015 will not lead to a significant reduction of matches or days on the road. What it will lead to is the loss of one of the key reasons behind the success of 2011. Ireland's victory over England, powered by O'Brien's astounding century, was a performance the like of which we may never again be privileged to witness - it was so unexpected, yet so majestic, that when the deal had been done, and Ireland really had chased 328 to beat England, having at one stage been 111 for 5, it seemed churlish to demean it as an upset. Not even Australia in their pomp could have won a game with more confidence. The knock-on effect was to electrify the permutations in Group B, where Bangladesh's fluctuations created a six-way tussle for four places. Though they wilted at the last against South Africa, their own story was a vital subplot in itself. It started with the youthful vigour they provided at the opening ceremony - a concept that tends to look laboured at sporting events where there's no Olympic flame to provide a focal point - and continued via the West Indies debacle and the subsequent stoning of the team bus, through to their own crowning moment against England. And all along the way, they - like the musically fuelled Sri Lankans - kept contributing the thrill of packed stadiums, a factor that had been so miserably absent throughout the previous World Cup. But in the end the whole narrative reverts back to India, and quite rightly so, because this was their year, and they earned it the hard way, soaking up the pressures and the doubts, as well as 28 years of World Cup failure. That they won the final in such style was magnificent, but their journey to that Sri Lanka showdown was every bit as gripping. Along the way they faced up to each of their major rivals, and there was not a dull contest among them. England battled to a tie, South Africa secured a thrilling run-chase, before Australia were dethroned and Pakistan denied in consecutive knock-out encounters. And then the party that kicked off on Saturday night was something to behold. If the purpose of sport is to fulfill a utilitarian brief of conferring the greatest pleasure for the greatest number, then the 2011 World Cup hit the spot like no other event in history. Sadly, however, there is so much more to it than that. Any sports fan with a moral compass, even one whose every wish has been granted this past week, will recognise that the tournament's true conclusion was signed and sealed not in the Wankhede Stadium, but in a Mumbai board-room, two days after the main event.